google-site-verification: google8d8438b214143f71.html Beautiful Quotes: True Love Is Finding One Who Never Turns Their Back On You. 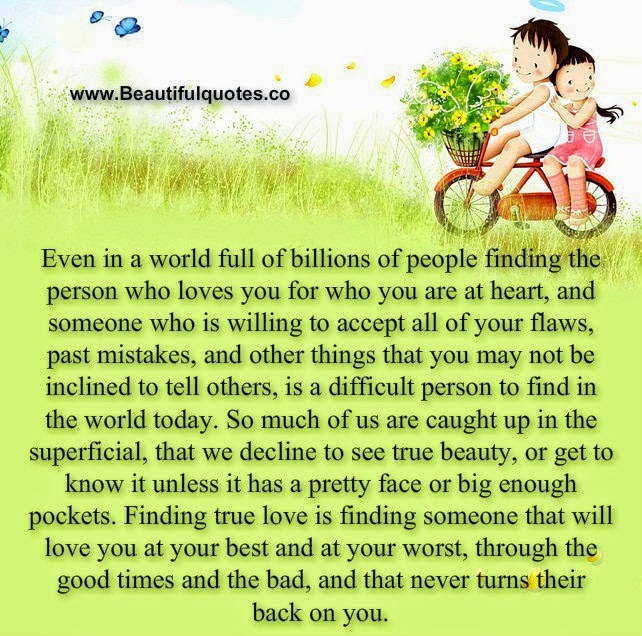 Even in a world full of billions of people finding the person who loves you for who you are at heart, and someone who is willing to accept all of your flaws, past mistakes, and other things that you may not be inclined to tell others, is a difficult person to find in the world today. So much of us are caught up in the superficial, that we decline to see true beauty, or get to know it unless it has a pretty face or big enough pockets. Finding true love is finding someone that will love you at your best and at your worst, through the good times and the bad, and that never turns their back on you.